Frank Croal was born circa 1863 at Wisconsin. Frank Croal died after 1911. 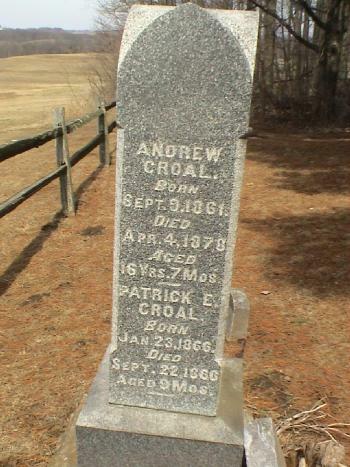 Andrew Croal was born on 9 September 1861 at Wisconsin. 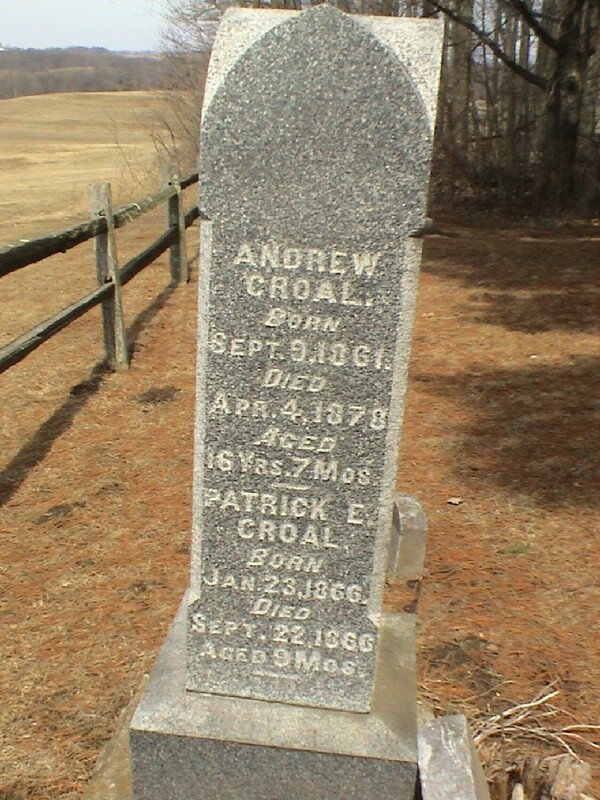 Andrew Croal died on 4 April 1878 at age 16. John Clinton Croal was born circa 1858 at Wisconsin. John Clinton Croal died on 9 December 1905 at San Francisco, California, age 47. 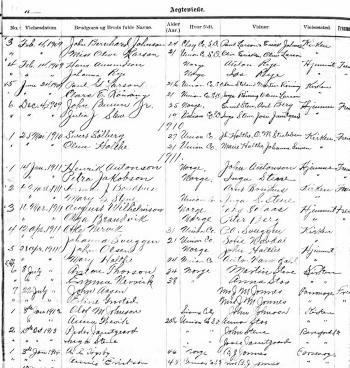 In 1904 at California Voter Registrations, San Francisco, California. John Clinton Croal lived in 1904 at 449 Minna - 2nd Floor Room M, San Francisco, San Francisco, California. 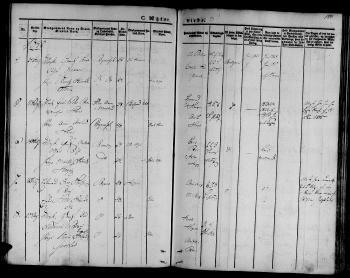 [S248] U.S. Federal Census 1860 U.S. Federal Census, by Ancestry.com, Dwelling 1102. Page 145. 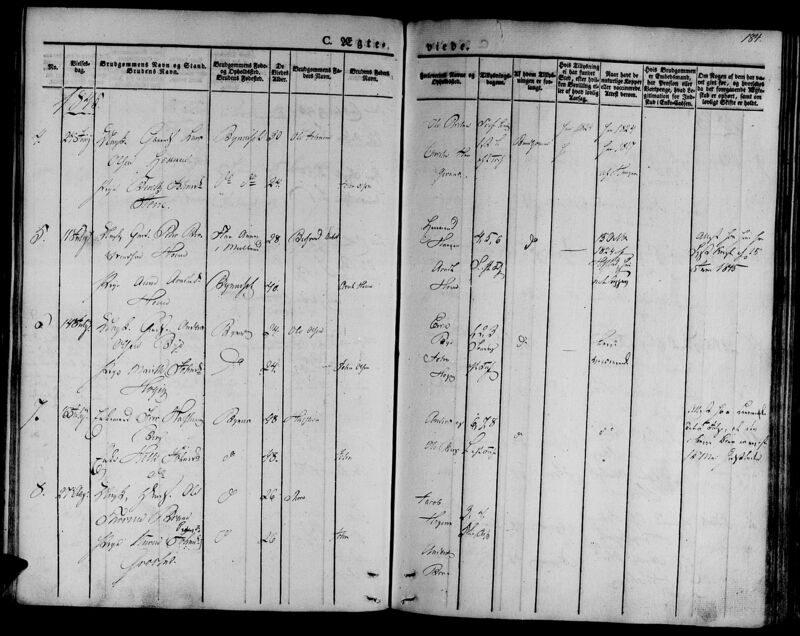 [S246] U.S. Federal Census 1880 U.S. Federal Census, by Ancestry.com, Dwelling 156. 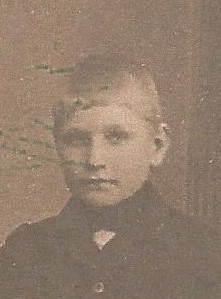 Freddie Harold Mikkelsen died in 1919. 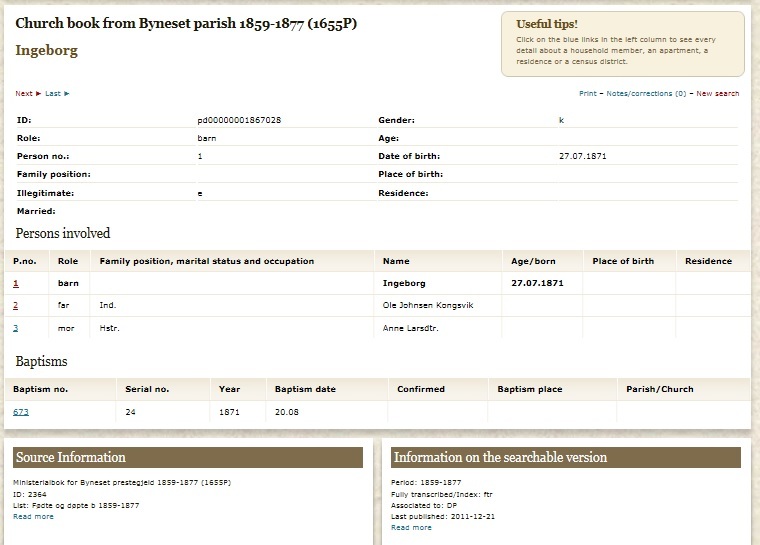 He was the son of Lindhart Mikkelsen and Wilhelmena Augusta Frohreich. Josephine P. Mikkelsen was born in 1920 at South Dakota. 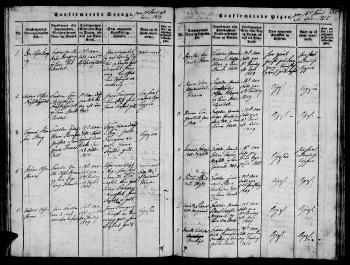 She was the daughter of Lindhart Mikkelsen and Wilhelmena Augusta Frohreich. Josephine P. Mikkelsen died in 1947. Kenneth K. Mikkelsen was born on 2 August 1922 at Charles Mix, South Dakota. Kenneth K. Mikkelsen married Arlene Margaret Adams, daughter of Charles Adams and Margaret Flamming, on 22 October 1951 at Luverne, Rock, Minnesota. Kenneth K. Mikkelsen died on 2 December 1996 at age 74 Kenneth Clifford Mikkelsen, 74, of Geddes, died Monday (Dec. 2 1996) in an auto accident northeast of Armour. Services are 10 a.m. Friday at the United Methodist Church, Geddes, with burial in Pleasant Lawn Cemetery, Geddes. Visitation is 3-6 p.m. Thursday at the Clements-Wiese Funeral Chapel, Geddes. 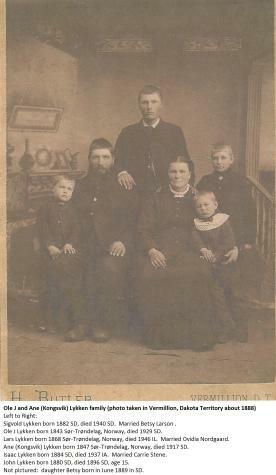 He was born Aug. 2, 1922, in Charles Mix County near Geddes to Lyndhart and Wilhelmina (Froehlich) Mikkelsen. He grew up and attended country school in Charles Mix County. He married Arlene Adams Oct. 22, 1951, in Luverne, Minn. They lived in the Platte and Geddes areas for the last 40 years and on the homestead farm near Geddes since 1964. He was a mechanic and ran Mikkelsen Repair at the farm until his retirement. 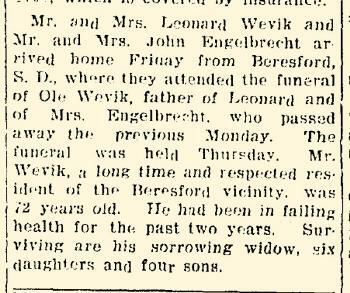 He is survived by his four children: Gene, Franktown, Colo; Susan (Mrs. Russ) Dangel, Parker; Larry, Kearney, Neb; and Wayne, Yankton; four grandchildren; and one sister, Frieda Kirchhevel, Harvard, Neb. He is preceded in death by his parents, an infant son, one brother and one sister. Kenneth K. Mikkelsen obtained US Social Security Card at South Dakota. 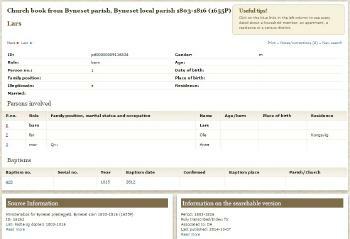 Married Name 22 October 1951 As of 22 October 1951,her married name was Mikkelsen. Arlene Margaret Adams was born on 11 April 1929 at White Lake, South Dakota. She was the daughter of Charles Adams and Margaret Flamming. Arlene Margaret Adams married Kenneth K. Mikkelsen, son of Lindhart Mikkelsen and Wilhelmena Augusta Frohreich, on 22 October 1951 at Luverne, Rock, Minnesota. Arlene Margaret Adams died on 2 December 1996 at age 67 Arlene M. Mikkelsen, 67, of Geddes, died Monday (Dec. 2 1996) in an auto accident northeast of Armour. Services are 10 a.m. Friday at the United Methodist Church, Geddes, with burial in Pleasant Lawn Cemetery, Geddes. Visitation is 3-6 p.m. Thursday at the Clements-Wiese Funeral Chapel, Geddes. She was born April 11, 1929, in White Lake, to Charles and Margaret (Flamming) Adams. She grew up and attended country school near White Lake. She married Kenneth Mikkelsen in Luverne, Minn., Oct. 22, 1951. She was a homemaker and they lived on the Mikkelsen homestead farm since 1964. She is survived by her four children: Gene, Franktown, Colo; Susan (Mrs. Russ) Dangel, Parker; Larry, Kearney, Neb; and Wayne, Yankton; four grandchildren; two brothers: Earl Adams, Plankinton; and Jack Adams of the Philippines; and two sisters: Lorrainne Redman, Wessington Springs, and Helen Hohenstein. She is preceded in death by her parents, an infant son and three brothers. Arlene Margaret Adams obtained US Social Security Card at South Dakota. Ralph Everett Adams was born on 30 June 1912 at Illinois. 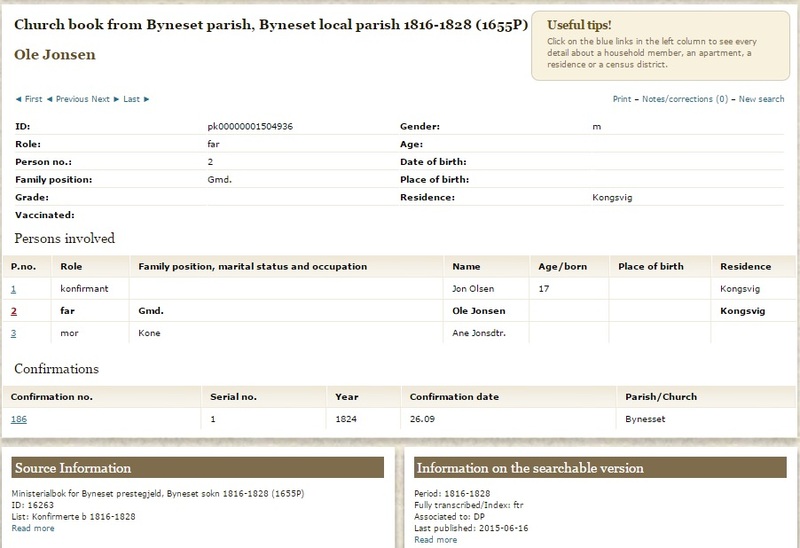 He was the son of Leslie Byron Adams and Ida Linda Klemme. Ralph Everett Adams died on 24 April 1989 at age 76. Name Variation Fern Madelyn Adams was also known as Ferne. Married Name 1 April 1933 As of 1 April 1933,her married name was Williams. Fern Madelyn Adams was born on 6 August 1914 at Illinois. She was the daughter of Leslie Byron Adams and Ida Linda Klemme. Fern Madelyn Adams died on 3 April 1986 at age 71. On 12 October 1961 at Crete, Will, Illinois, Leslie and Ida (Klemme) Adams 50th wedding anniversary celebration. Harold Corwin Adams was born on 27 July 1917 at Crete, Will, Illinois. Harold Corwin Adams died on 6 October 1974 at Steger, Will, Illinois, at age 57. Harold Corwin Adams obtained US Social Security Card at Nebraska; last residence not specified. On 12 October 1961 at Crete, Will, Illinois, Leslie and Ida (Klemme) Adams 50th wedding anniversary celebration. On 28 April 1963 at Crete, Will, Illinois, attended Gus and Edna (Klemme) Janetske 40th wedding anniversary surprise party. James Robert Adams was born on 2 January 1920 at Illinois. James Robert Adams died on 27 December 2003 at age 83. 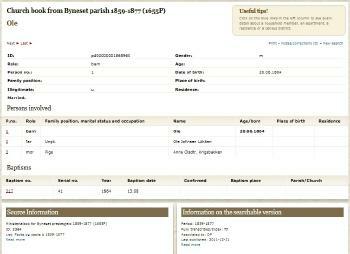 James Robert Adams obtained US Social Security Card at Illinois; last residence Frankfort, Will, Illinois. On 12 October 1961 at Crete, Will, Illinois, Leslie and Ida (Klemme) Adams 50th wedding anniversary celebration. Marion Helen Adams was born on 2 April 1922 at Illinois. Marion Helen Adams died on 30 June 1939 at age 17. Married Name 2 July 1971 As of 2 July 1971,her married name was Schlosser. Marjorie Jean Hartmann was born on 5 April 1927 at Steger, Will, Illinois. 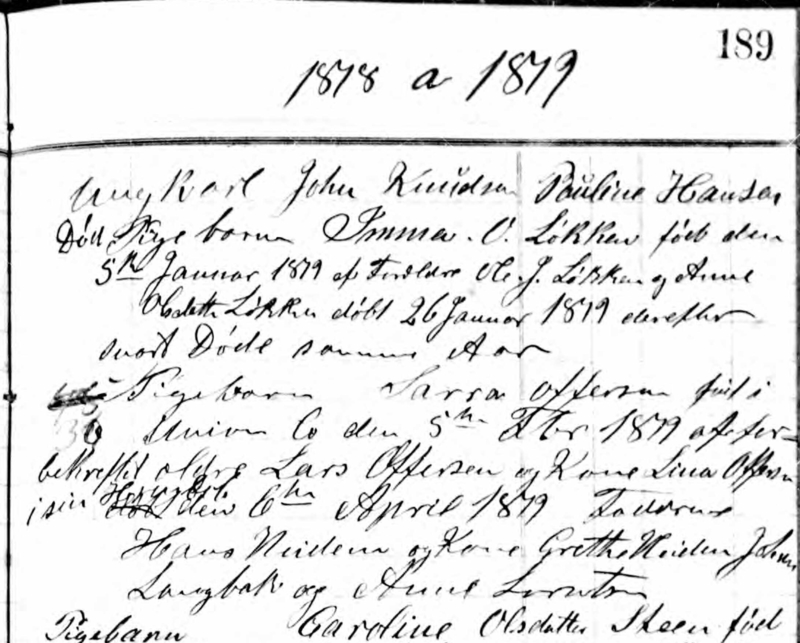 She was the daughter of Arnold Carl Hartmann and Katherine Elenore Klemme. Marjorie Jean Hartmann married Arthur J. Schlosser on 2 July 1971 at Chicago, Cook, Illinois. Marjorie Jean Hartmann died on 8 May 1989 at University Park, Illinois, at age 62. Marjorie Jean Hartmann obtained US Social Security Card at Illinois; last residence Park Forest, Cook, Illinois. Married Name 15 August 1941 As of 15 August 1941,her married name was Johnson. Married Name 29 July 1978 As of 29 July 1978,her married name was Marshall. Lois June Hartmann was born on 4 October 1921 at South Chicago Heights, Cook, Illinois. Lois June Hartmann married Robert Frederick Johnson on 15 August 1941 at Steger, Will, Illinois. Lois June Hartmann married George Thomas Marshall on 29 July 1978 at West Orange, New Jersey. Lois June Hartmann died on 5 April 1984 at Branford, Connecticut, at age 62. Lois June Hartmann obtained US Social Security Card at Illinois; last residence not specified. Name Variation Margaret E. Honner was also known as Maggie. Married Name circa 1901 As of circa 1901,her married name was Kane. Margaret E. Honner was born in 1876 at Iowa. She was the daughter of (?) Honner and unknown (?). Margaret E. Honner married Joseph C. Kane, son of Henry Kane and Mary McCollon, circa 1901. Margaret E. Honner died in 1945. She was buried in 1945 at St. Ann's Catholic Cemetery, near Geddes, Charles Mix, South Dakota, Block 34 Lot 2 Grave 7. 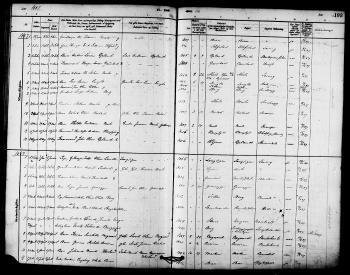 Margaret E. Honner had zero children. 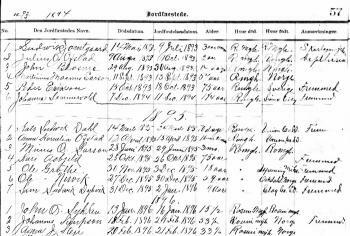 Ole Olsen Wevik was born on 20 June 1864 at Byneset, Sor Trondelag, Norway. 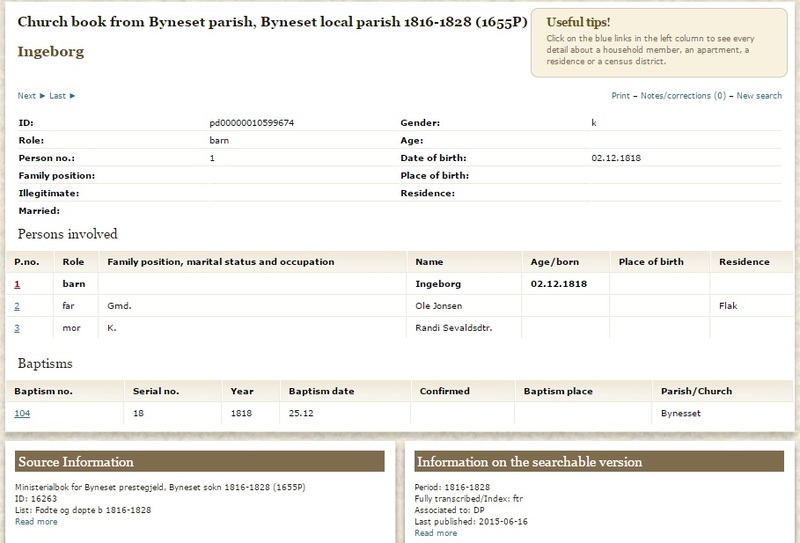 He was the son of Ole Jonsen Lykken and Anne Olsdatter. 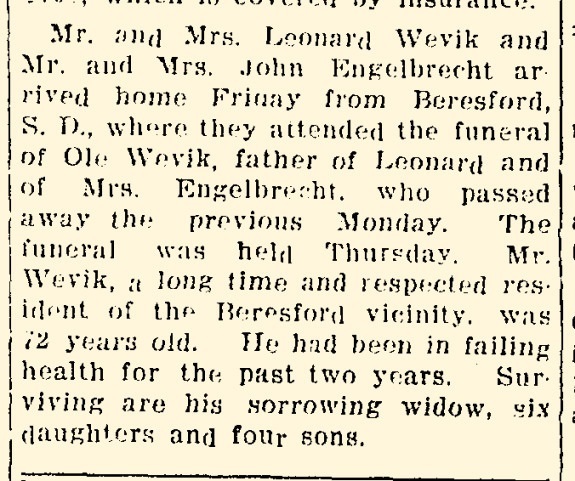 Ole Olsen Wevik died on 11 January 1937 at Beresford, Union, South Dakota, at age 72 Ole Wevik death notice. He was buried on 14 January 1937 at Beresford Cemetery, Prairie Township, T95N R50W Sec. 4, just east of Beresford, Union, South Dakota, Wevik, Olie Grave 2 Lot 67 Block 4. Death: 1937 Age: 73. 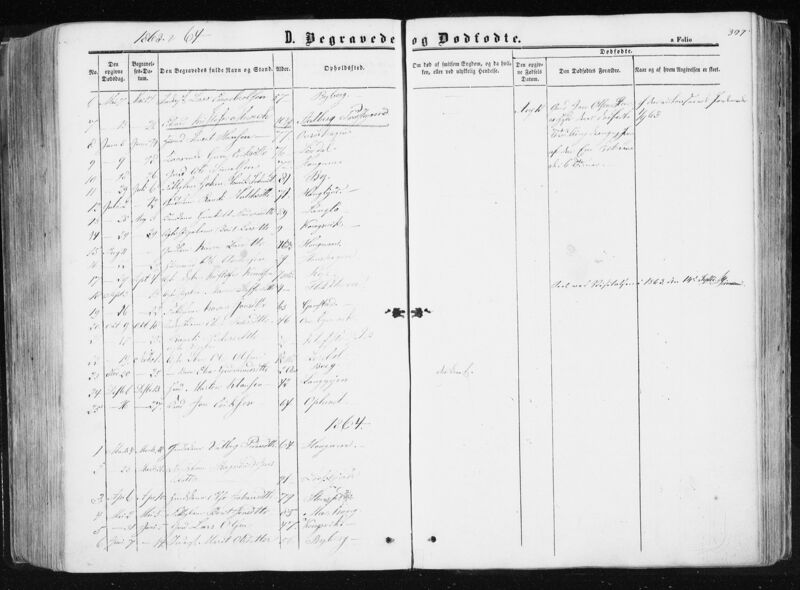 [S242] Unknown compiler, Familysearch.com film record 1903899. 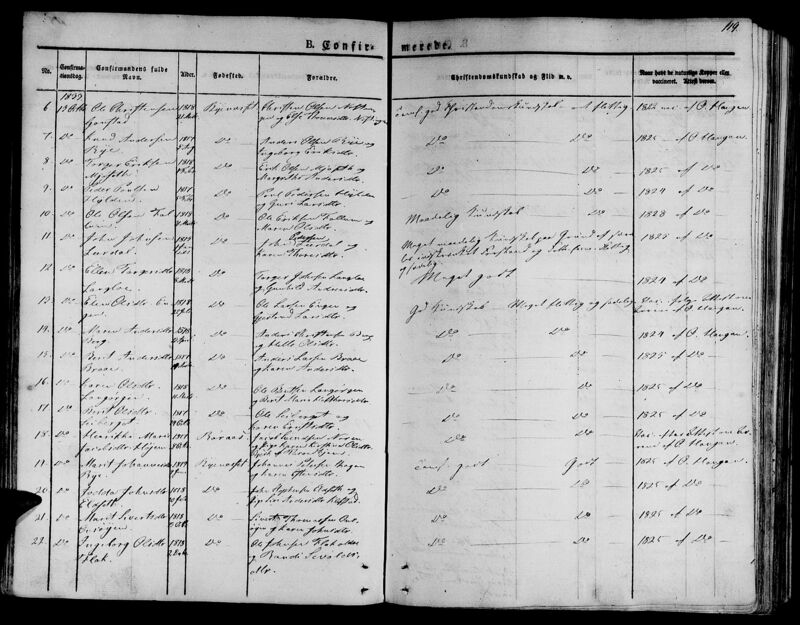 [S245] U.S. Federal Census 1900 U.S. Federal Census, by Ancestry.com, ED 340. Sheet 9A-9B. Stamp 254. Dwelling 151. 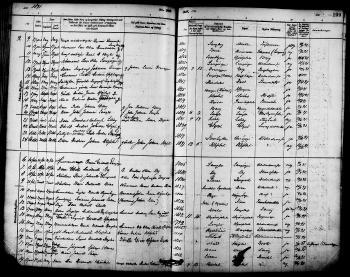 [S243] U.S. Federal Census 1920 U.S. Federal Census, by Ancestry.com, ED250, Sheet 3A, dwelling 44. 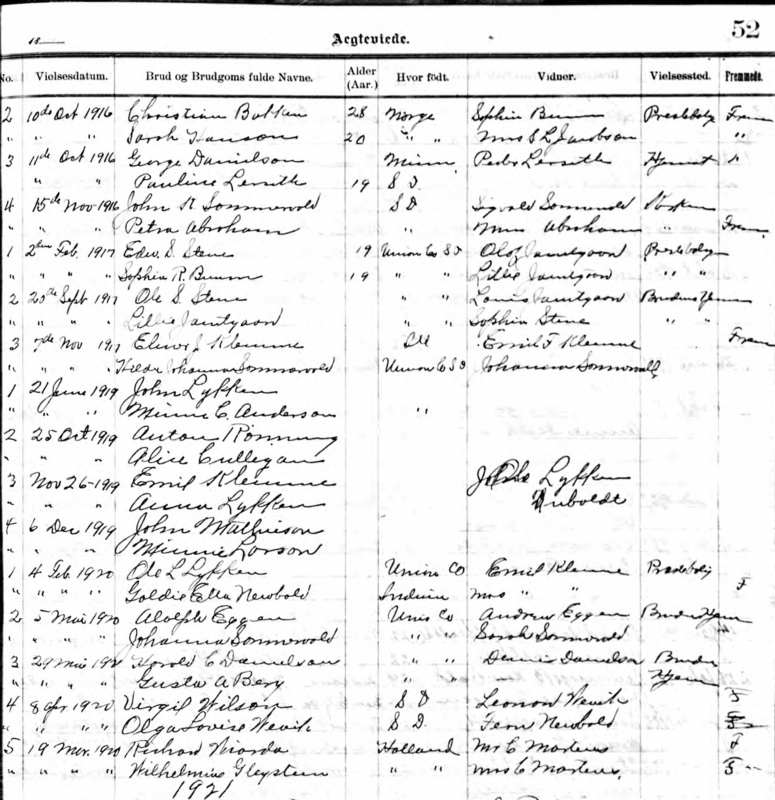 [S250] U.S. Federal Census 1930 U.S. Federal Census, by Ancestry.com, ED64-10. Dwelling 25. 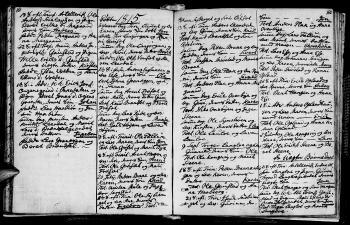 [S8] "Anna Klemme Journal,", Pg 37. 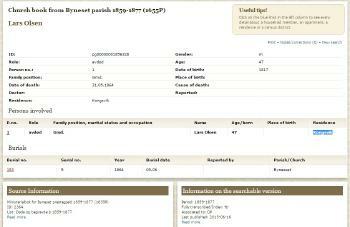 [S261] Land Office Records Land Patent Record, by Bureau of Land Management, Accession/Serial #: 259242 BLM Serial #: SDBF 0003902. Name Variation Jon Olsen Lykken was also known as John. Name Variation Jon Olsen Lykken was also known as Løkken. He was born in 1808 at Løkken farm, Byneset, Sor Trondelag, Norway, also reported as 1817. 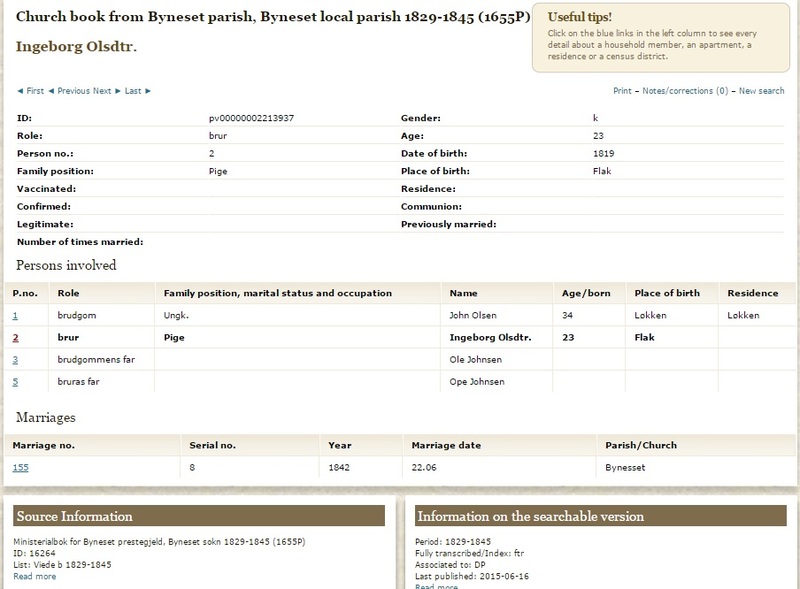 He was the son of Ole Jonsen Lykken and Ane Jonsdatter. 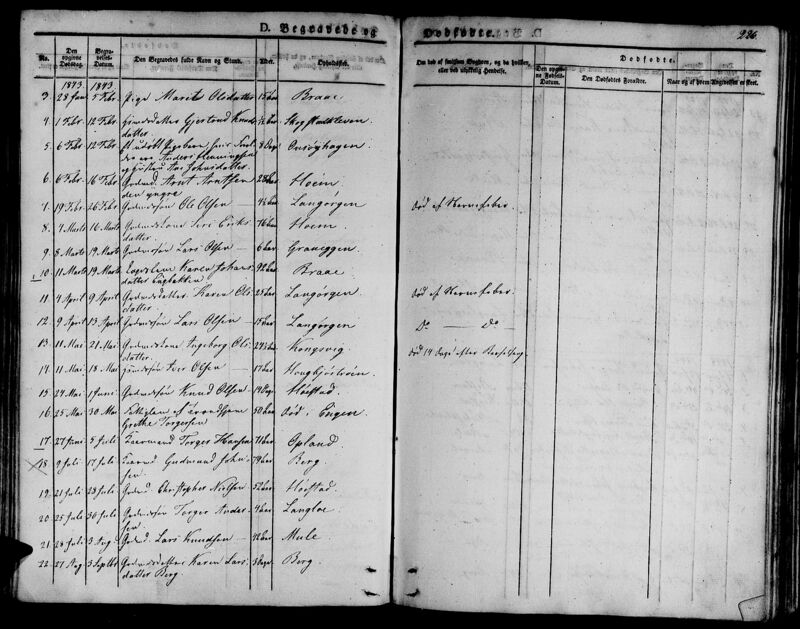 Jon Olsen Lykken married Helle Sivertsdatter after 1844. 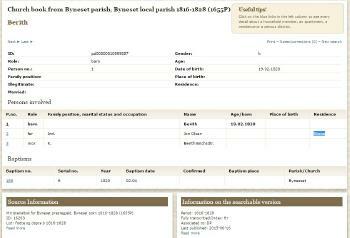 [S375] Norwegian National Archives Digital Archives, by Norwegian government, SAT, Ministerialprotokoller, klokkerbøker og fødselsregistre - Sør-Trøndelag, 612/L0371: Parish register (official) no. 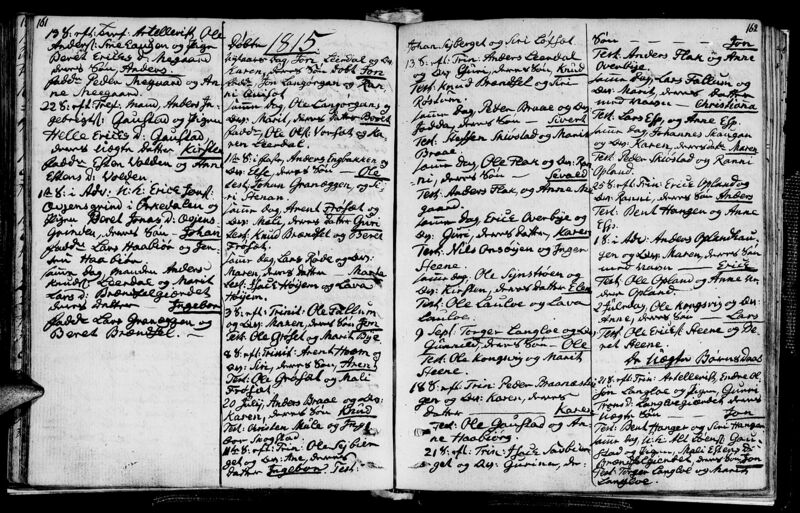 612A05, 1803-1816, p. 147-148. 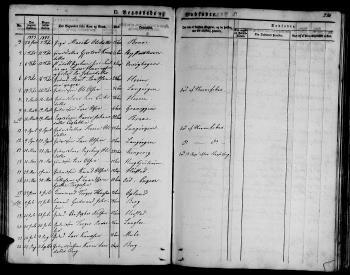 Name Variation Ingeborg Oldsdatter Flak was also known as Ingeborg Olsdatter. 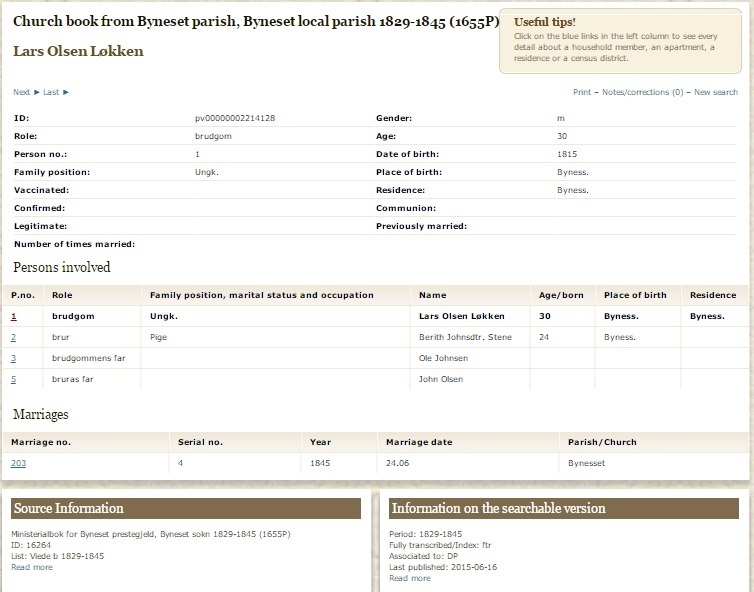 Married Name 22 June 1842 As of 22 June 1842,her married name was Lykken. 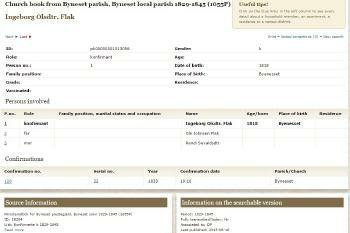 Ingeborg Oldsdatter Flak was born on 2 December 1818 at Flak farm, Byneset, Sør-Trøndelag, Norway, also reported as 1819 and 1821. 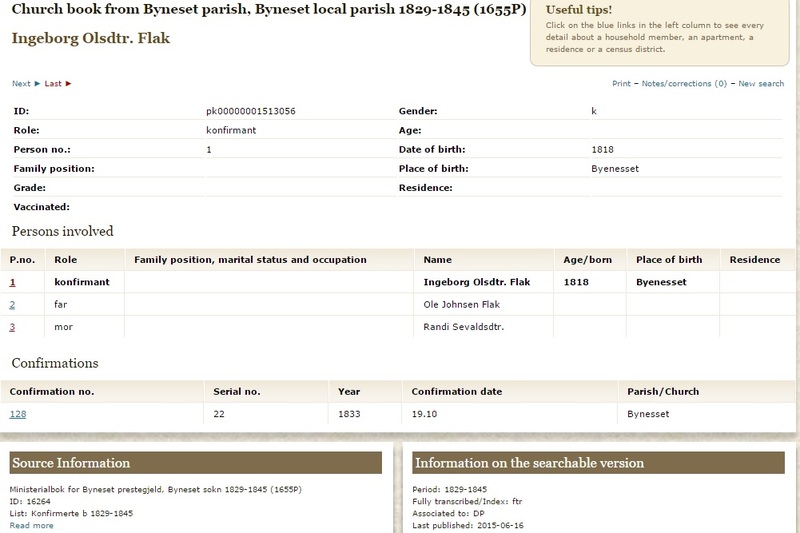 She was the daughter of Ole Jonsen Flak and Randi Sevaldsdatter. 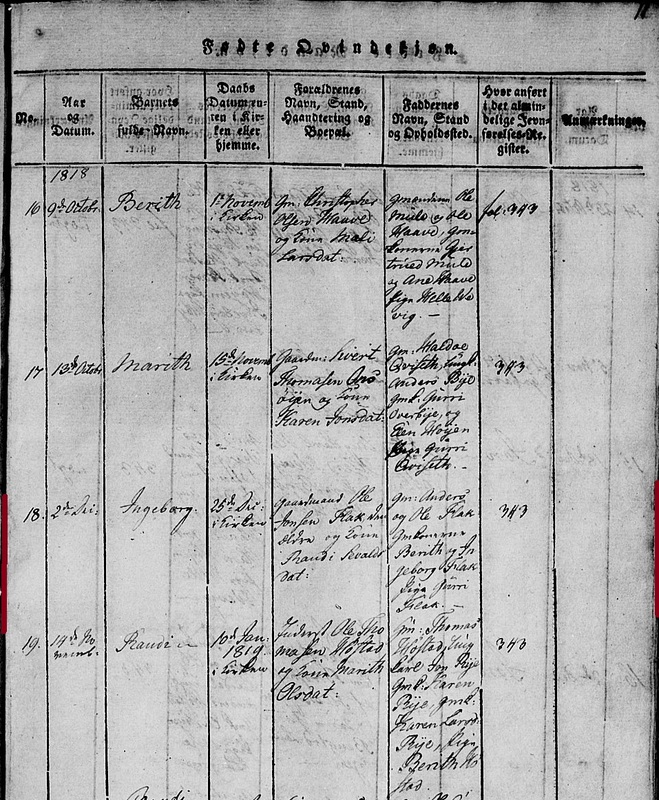 List: Fødte og døpte b 1816-1828. 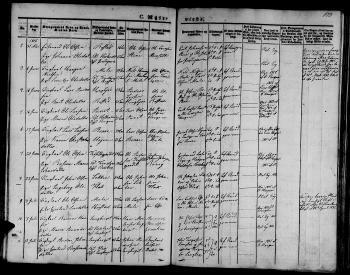 List: Døde og begravde b 1829-1845. 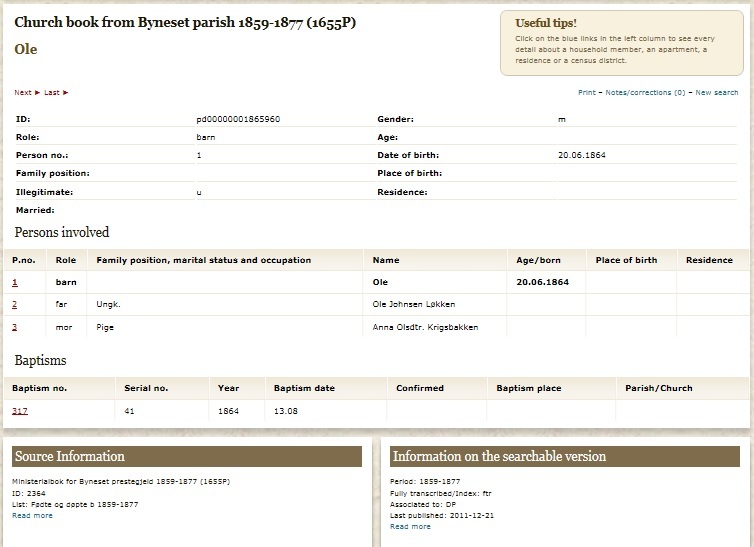 Name Variation Lars Olsen Lykken was also known as Kongsvig. 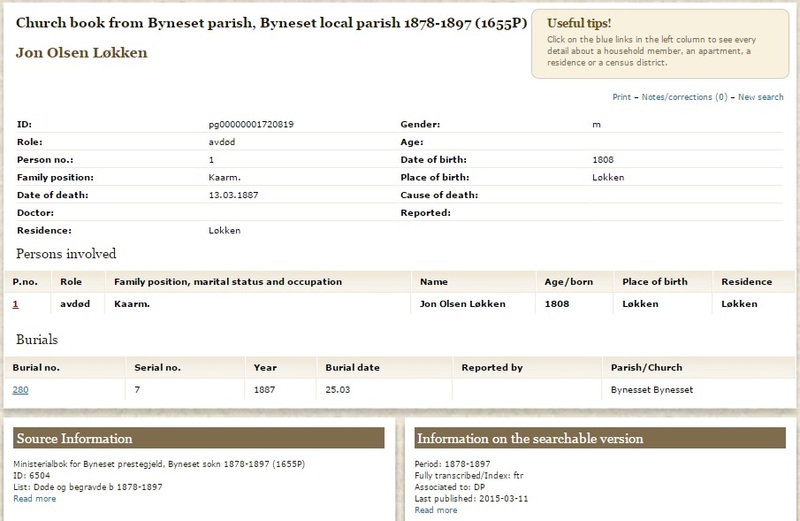 Name Variation Lars Olsen Lykken was also known as Kongsvik. 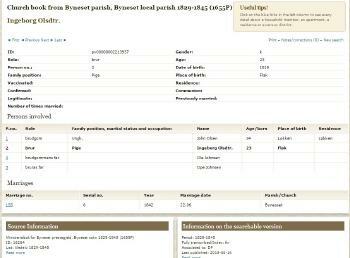 Name Variation 1847 As of 1847, Lars Olsen Lykken was also known as Kongsvig farm name. 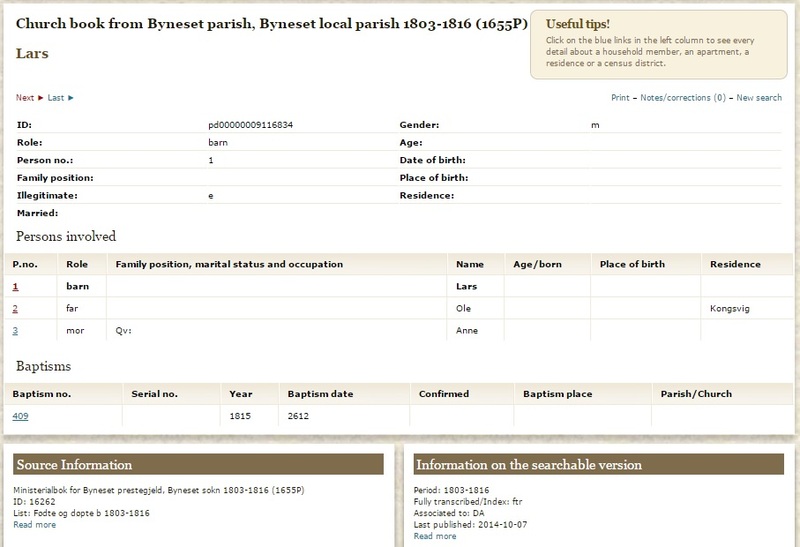 Lars Olsen Lykken was born in 1815 at Byneset, Sør-Trøndelag, Norway, also reported as 1814 and 1817. 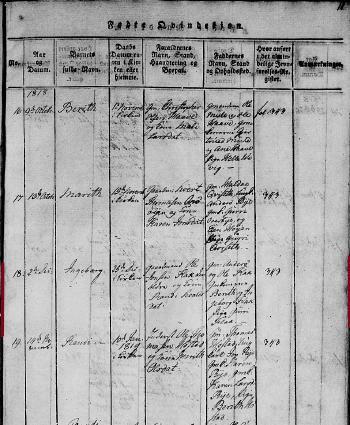 List: Fødte og døpte b 1803-1816. 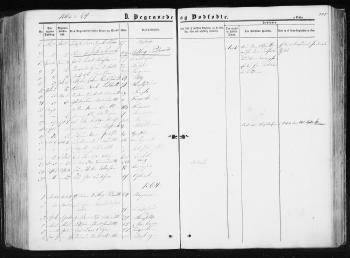 List: Døde og begravde b 1859-1877. Name Variation Berit Johnsdatter Stene was also known as Berith. 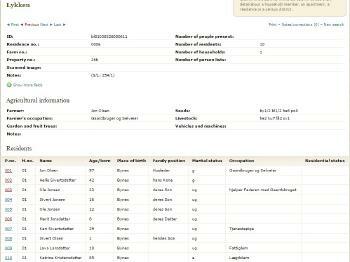 Name Variation Berit Johnsdatter Stene was also known as Beret J. 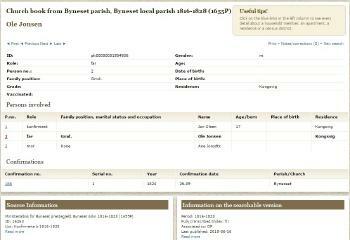 Name Variation Berit Johnsdatter Stene was also known as Bereth Johnsdatter. 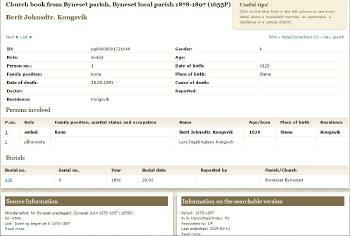 Married Name 24 June 1845 As of 24 June 1845,her married name was Kongsvik. Berit Johnsdatter Stene was born on 19 February 1820 at Stene Nerjurstu, Byneset, Sør-Trøndelag, Norway. 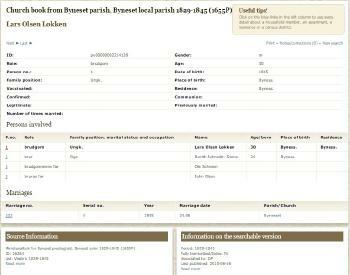 She was the daughter of Jon Olsen Stene and Berith Erichsdatter. 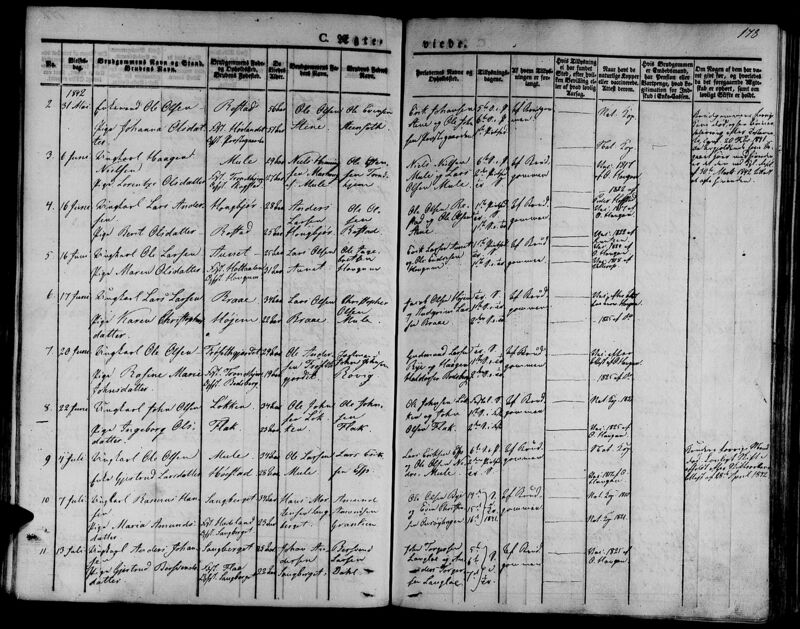 Berit Johnsdatter Stene married Lars Ingebrigtsen Kongsvik after May 1864 2nd marriage for Berit. Berit Johnsdatter Stene died on 18 February 1891 at Kongsvik, Byneset, Sør-Trøndelag, Norway, at age 70. Name Variation Ingeborg Olsdatter was also known as Ingeborg Olsdatter Lykken. 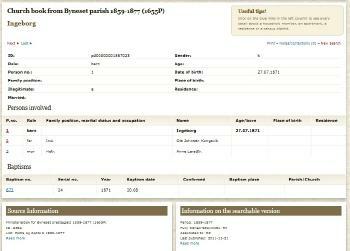 Ingeborg Olsdatter was born on 27 July 1871 at Byneset, Sor Trondelag, Norway. She died on 30 October 1871 at Byneset, Sor Trondelag, Norway. 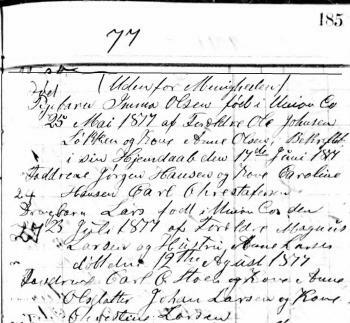 Name Variation Emma Olsdatter Lykken was also known as Imma O.
Emma Olsdatter Lykken was born on 5 January 1879 at Union, South Dakota. 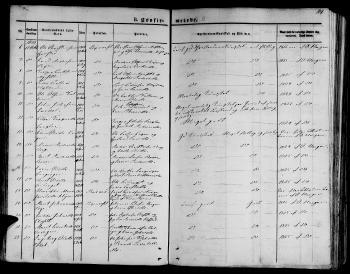 Emma Olsdatter Lykken was christened on 26 January 1879 at Roseni Parish, Union, South Dakota. She died in 1879 at Union, South Dakota. Name Variation Emma Olsdatter Lykken was also known as Imma Olsen. Emma Olsdatter Lykken was buried in 1877 at Roseni Cemetery, Union, South Dakota. She was born on 25 May 1877 at Union, South Dakota, also reported as 25 March 1877. 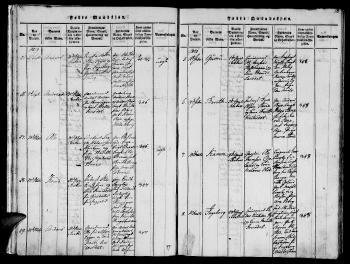 Emma Olsdatter Lykken was christened on 17 June 1877 at Roseni Parish, Union, South Dakota. She died in 1877 at Union, South Dakota. John Olsen Lykken was born on 14 June 1880 at Union, South Dakota. 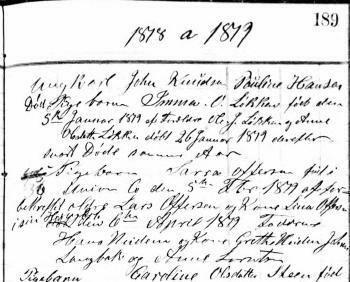 John Olsen Lykken was christened on 27 June 1880 at Roseni Parish, Union, South Dakota. He died on 13 January 1896 at Union, South Dakota, at age 15. He was buried after 13 January 1896 at Roseni Cemetery, Emmet, Union, South Dakota, Lyken, John Grave: 1, Lot: 55, Death: 1896, Age: 16. 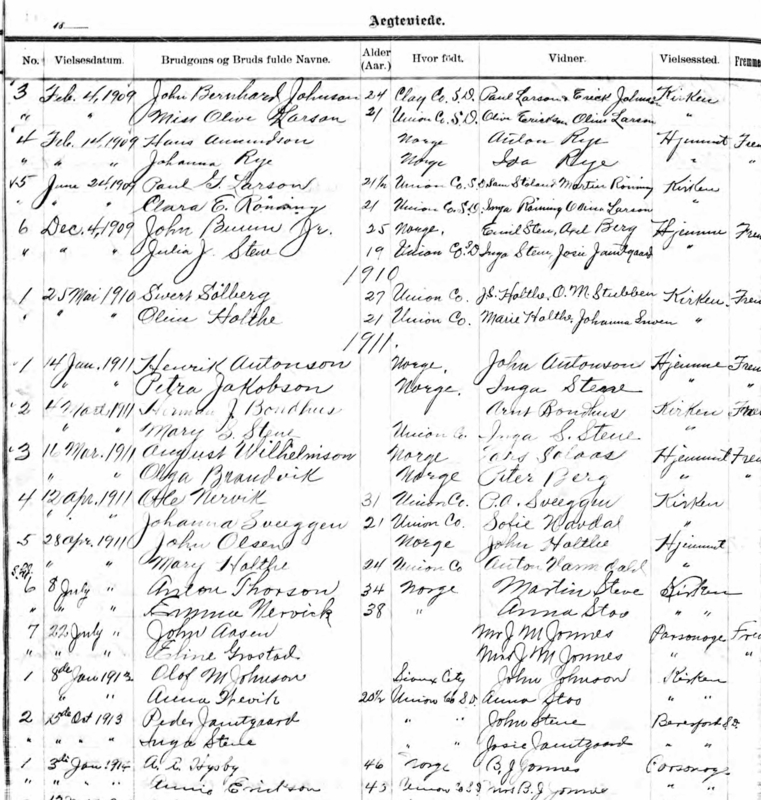 Married Name May 1885 As of May 1885,her married name was Wevik. Lizzie Solem was born on 6 May 1870 at Gayville, Clay, South Dakota. She was the daughter of Anders Gudbrandsen Solem and Helena Seth Bakken. Lizzie Solem died on 18 November 1949 at Beresford, Union, South Dakota, at age 79. She was buried after 18 November 1949 at Beresford Cemetery, Prairie Township, T95N R50W Sec. 4, just east of Beresford, Union, South Dakota. On 5 January 1940 at Emil and Grace Wevik Engelbrecht and daughters visited Mrs. Lizzie Wevik. On 20 July 1949 at 2nd birthday party for Jimmie Engelbrecht including 9 grandparents, great-grandparents. Name Variation Alfred O. Wevik was also known as Adolf Alfred. Alfred O. Wevik was born on 24 July 1887 at Union, South Dakota. 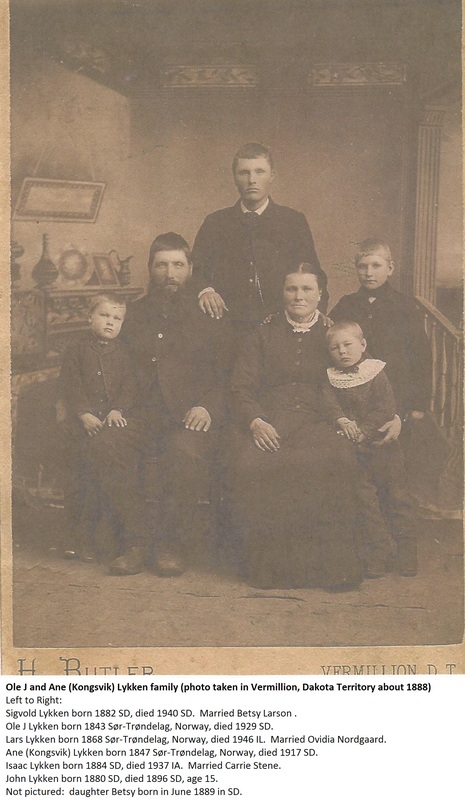 He was the son of Ole Olsen Wevik and Lizzie Solem. 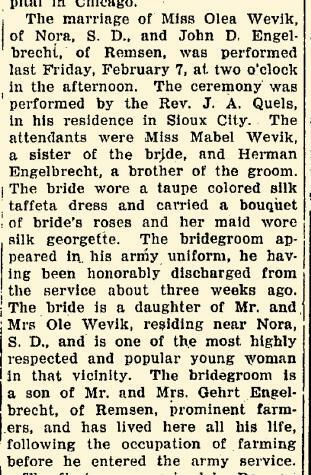 Alfred O. Wevik married Ida Husby, daughter of Even Ingebretsen Husby and Johanna Steffensdatter Olson, on 14 March 1914 at Romsdal Lutheran Church, Beresford, Union, South Dakota. Alfred O. Wevik died on 17 May 1948 at age 60. 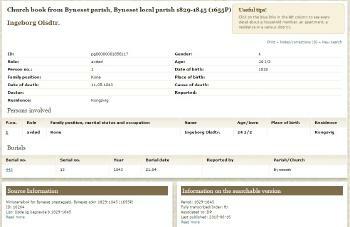 He was buried after 17 May 1948 at Roseni Lutheran Church Cemetery, Beresford, Union, South Dakota. 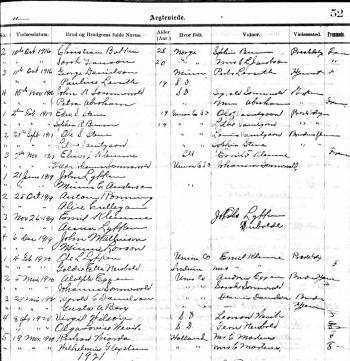 [S243] U.S. Federal Census 1920 U.S. Federal Census, by Ancestry.com, ED250, Sheet 2B, dwelling 32. [S261] Land Office Records Land Patent Record, by Bureau of Land Management, Accession/Serial #: 353822 BLM Serial #: SDBF 0003904. Married Name 8 January 1913 As of 8 January 1913,her married name was Johnson. Anna Wevik was born on 16 October 1892 at Union, South Dakota. 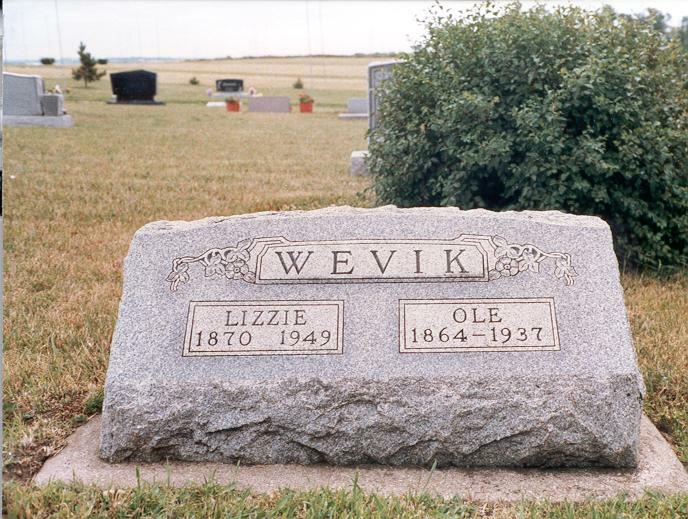 She was the daughter of Ole Olsen Wevik and Lizzie Solem. 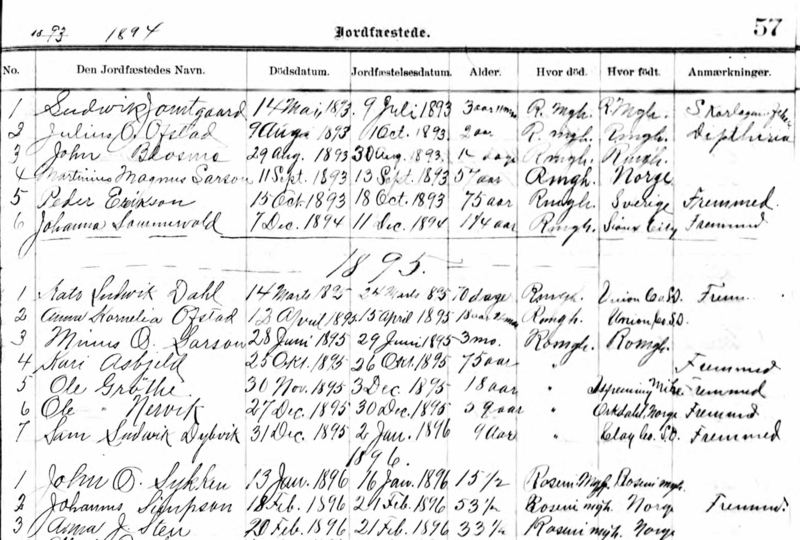 Anna Wevik married Olaf M. Johnson on 8 January 1913. Anna Wevik died on 15 January 1945 at age 52. [S250] U.S. Federal Census 1930 U.S. Federal Census, by Ancestry.com, ED250. Dwelling 94. [S250] U.S. Federal Census 1930 U.S. Federal Census, by Ancestry.com, ED64-10. Dwelling 97. 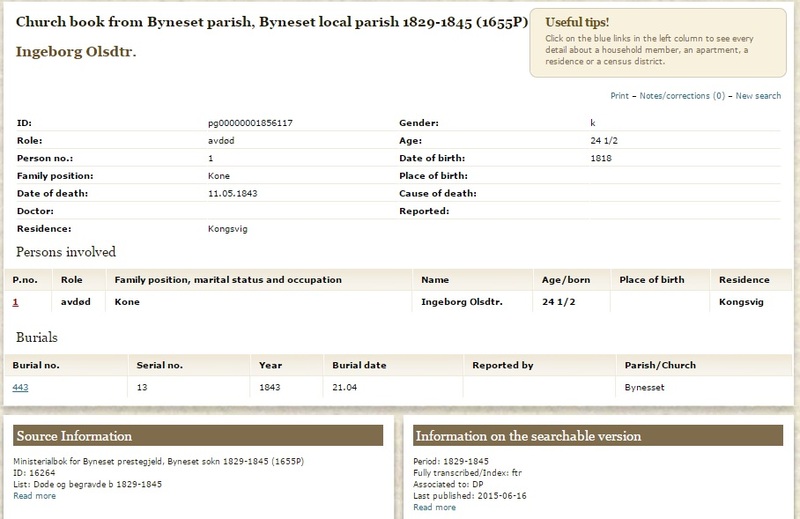 Name Variation Olea Wevik was also known as Agnes Stephine. 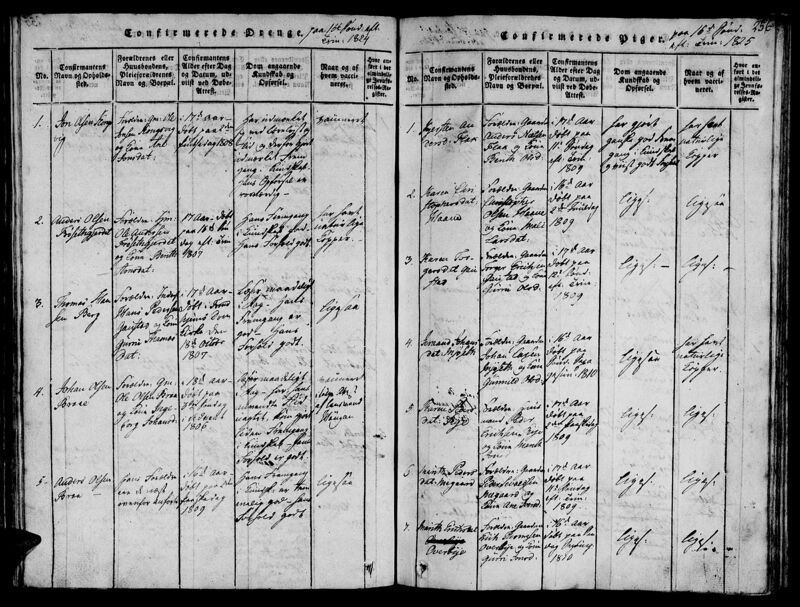 Married Name 7 February 1919 As of 7 February 1919,her married name was Engelbrecht. 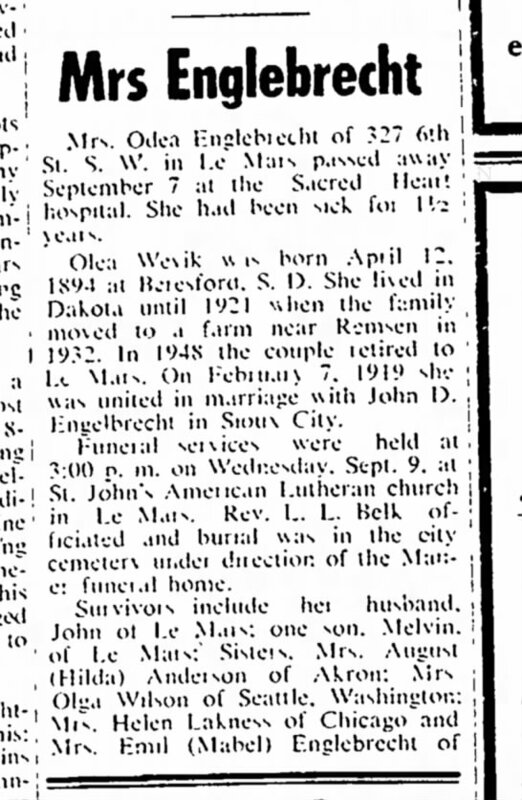 Olea Wevik was born on 12 April 1894 at Spink, Union, South Dakota, may be 5 Apr. 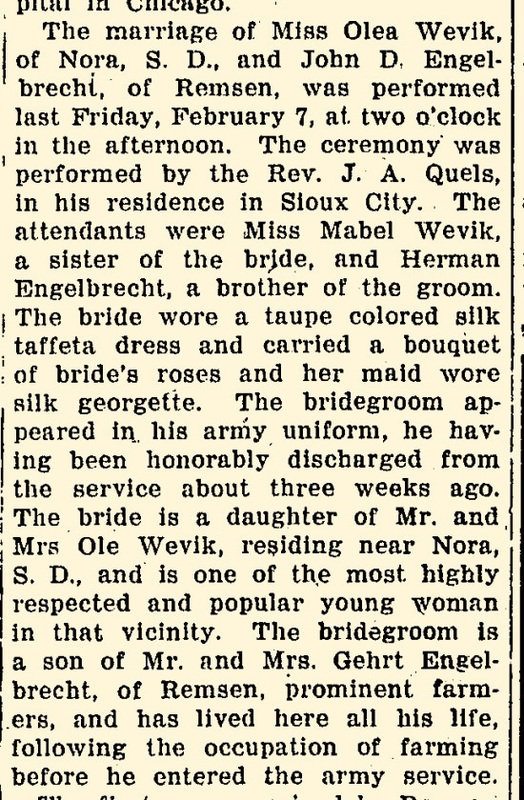 Olea Wevik married John Detloff Engelbrecht, son of Gehrt Engelbrecht and Amanda Wiekhorst, on 7 February 1919 at Sioux City, Iowa, Olea Wevik and John D Engelbrecht marriage announcement. 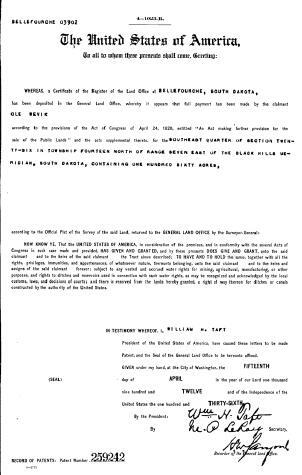 Olea Wevik witnessed the burial of Isaac Olsen Lykken Sr. after 12 December 1937 at Roseni Lutheran Church Cemetery, Beresford, Union, South Dakota; Gr 4, Lot 3, Blk 3; Isaac Lykken Sr funeral notice. 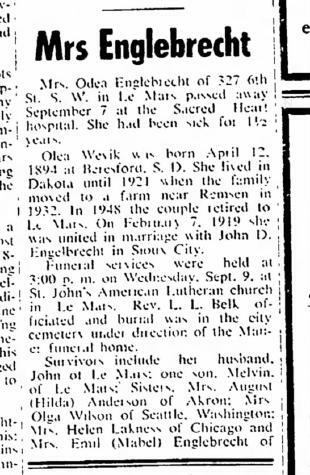 Olea Wevik died on 7 September 1953 at age 59 Olea (Wevik) Engelbrecht obituary. She was buried after 7 September 1953 at Memorial Cemetery, LeMars, Plymouth, Iowa. On 20 July 1949 at 2nd birthday party for Jimmie Engelbrecht including 9 grandparents, great-grandparents. Olea Wevik and John Detloff Engelbrecht lived in July 1951 at LeMars, Plymouth, Iowa. Olea Wevik was a witness when Emil Fred Klemme and Anna Marie Lykken were The 13th annual Lykken reunion was held Sunday, August 17, at the home of Mr. And Mrs. Emil Klemme at Akron. 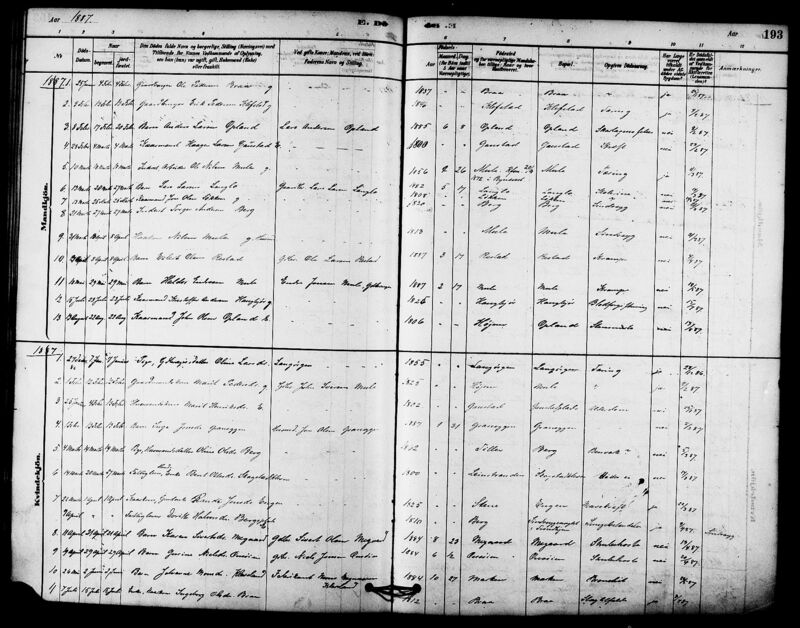 [S243] U.S. Federal Census 1920 U.S. Federal Census, by Ancestry.com, ED250. Dwelling 17. [S250] U.S. Federal Census 1930 U.S. Federal Census, by Ancestry.com, ED75-12. Dwelling 28. 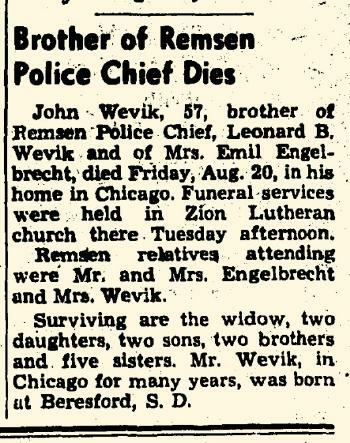 Name Variation John Almer Wevik was also known as Elmer John. Name Variation John Almer Wevik was also known as A. J. Name Variation John Almer Wevik was also known as Almer John. 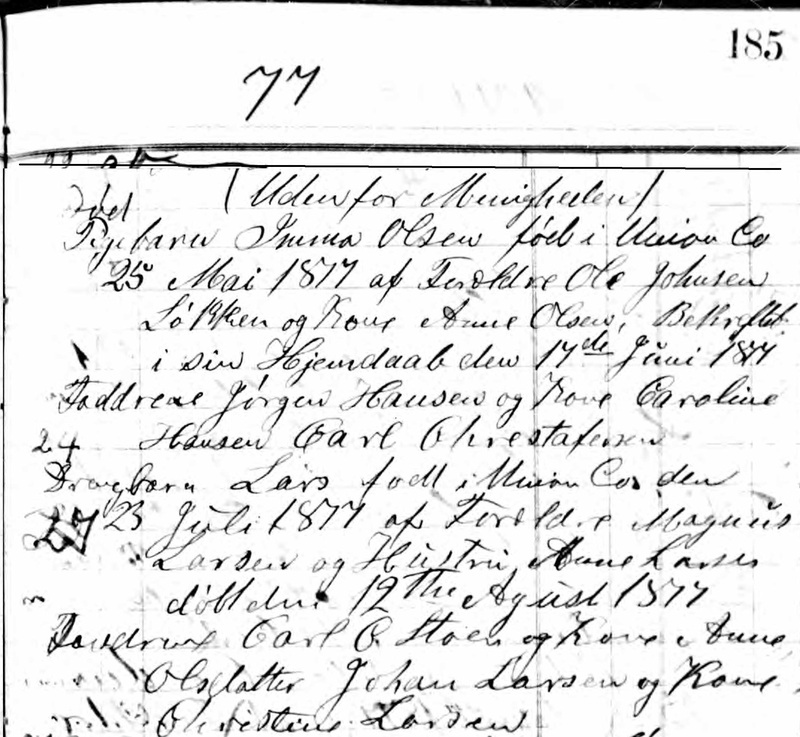 John Almer Wevik married Lillian Dorothea Fickbohm, daughter of Edward Lewis Fickbohm and Matilda Lewison, on 8 January 1920 at Roseni Lutheran Church, Beresford, Union, South Dakota. 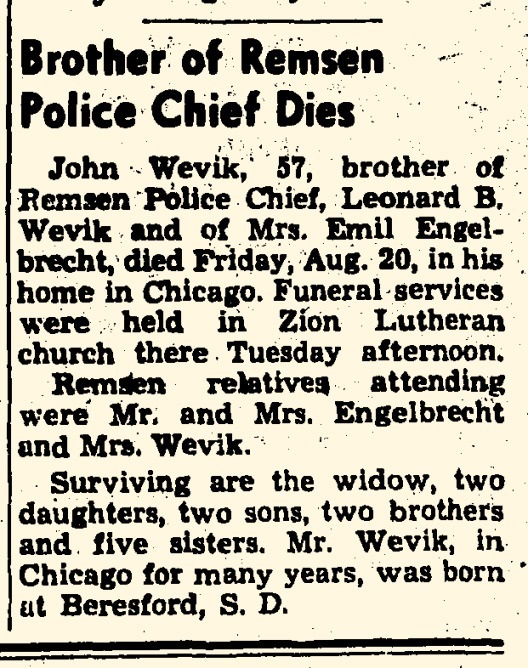 John Almer Wevik died on 20 August 1953 at Chicago, Cook, Illinois, at age 57 John Wevik obituary; also reported as 21 Aug 1953. He was buried after 20 August 1953 at Zion Lutheran Church, Chicago, Cook, Illinois. 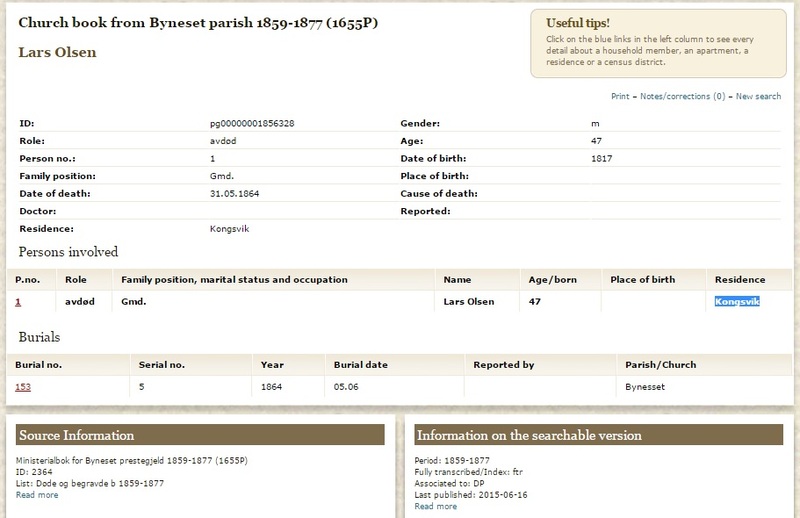 [S9] South Dakota, South Dakota Birth Records South Dakota, State File Number: 734153 (unknown file date). 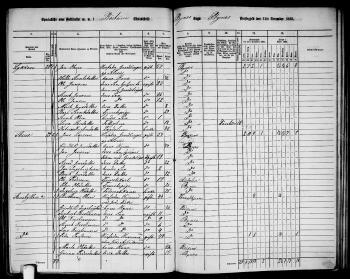 [S250] U.S. Federal Census 1930 U.S. Federal Census, by Ancestry.com, ED16-1214. Dwelling 13. Name Variation Olga Louise Wevik was also known as Olga E.
Married Name 8 April 1920 As of 8 April 1920,her married name was Wilson. Married Name 15 February 1954 As of 15 February 1954,her married name was Hicks. Olga Louise Wevik was born on 10 July 1898 at Spink, Union, South Dakota. Olga Louise Wevik died on 31 August 1981 at West Seattle General Hospital, Seattle, King, Washington, at age 83. She was buried after 31 August 1981 at Mountain View Memorial Park, Lakewood, Pierce, Washington, buried next to her first husband, Virgil Martin Wilson. Olga Louise Wevik obtained US Social Security Card at Washington; last residence Seattle, King, Washington; last name on SS Card is Wilson. [S250] U.S. Federal Census 1930 U.S. Federal Census, by Ancestry.com, ED27-150. Dwelling 26.